Here’s the second set of Major Key triads (in B this time) starting off the second inversion of the I chord (second string root). These have a nice flow and the I and IV shapes here should probably be old hat even if just as part of familiar bar chords. 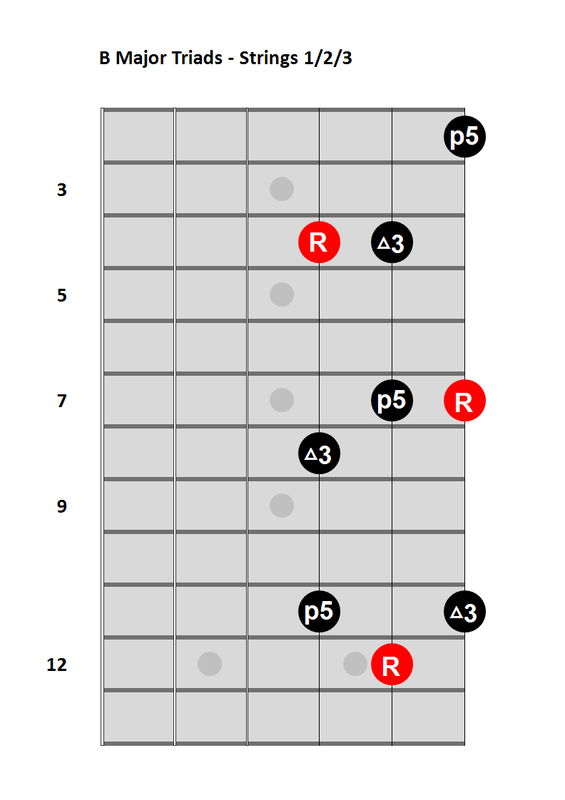 This is the first of an exploration into mapping out all triads in a key in close proximity. There’s no shortage of locations to work from, but this is the starting point I grab most frequently. Also included are characteristic notes for the associated modes to help add color highlighting where you are in the key. All labels are relative to the key center. On to the top three strings. 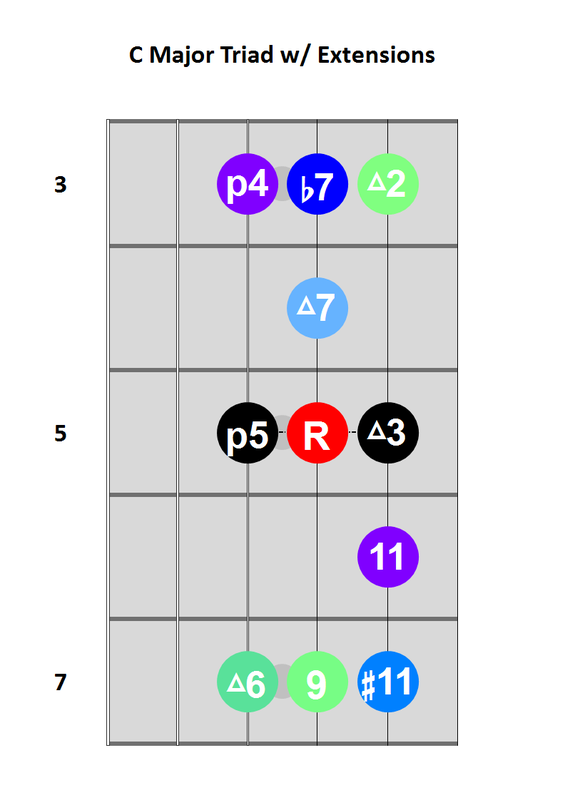 I’ve personally never spent enough time on the shapes on these strings, so this is a useful learning exercise, and hopefully sharing these proves helpful more broadly. 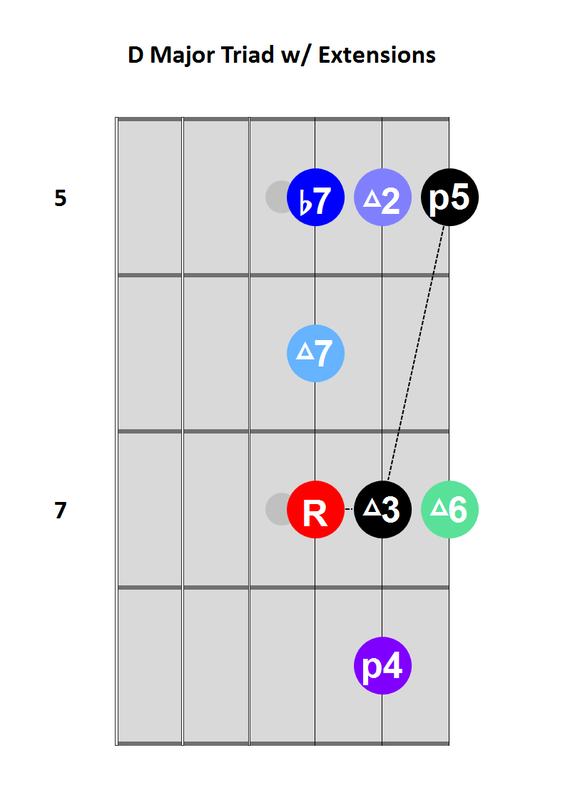 I’ve certainly never noticed that barring the top three strings gives you a major sixth or that you have a useful, easy sus2 in most pentatonic boxes. It’s time to move onto the triads on the first three strings. I’ve neglected learning these for far too long personally, so a good study of the major triads on 1/2/3 is warranted. It’s also probably time to start looking at the minor triads on both sets, which are easy to get to from their major counterparts. 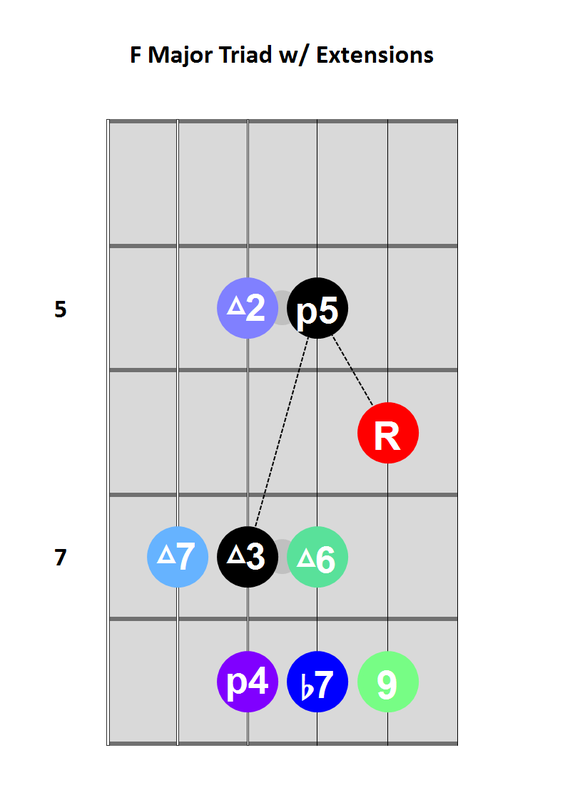 One last useful triad on strings 2/3/4. We all probably know this one, though I’ve never looked for the extensions until now. Knowing how to alter this simple bar is a great tool. This one shows up everywhere as well, and it’s very helpful to know your options when looking for embellishments.